As a culture we have gone from a denial of death to a fascination with the after-life. What truly happens when we die? If you have just started reading about near-death experiences then "Life After Life" is a good place to start. This book describes everything from being declared dead to seeing a "being of light" that guides then through a life review. For the most part this is a well-organized book that has some interesting stories told by people who were changed by their experience with death. Before reading this book I didn't know that some people heard music or other sounds as they died. Other than that I'd heard about most of the steps people go through when they die. Floating above the body seems very common and seeing relatives is also expected. Then there are a few unique experiences. For example, after their experience some people develop psychic powers and are able to read people's thoughts. I recently read Saved by the Light: The True Story of a Man Who Died Twice and the Profound Revelations He Received which is a very exciting book that describes heaven. While "Life After Life" is still compelling it lacks descriptions of heaven or hell. For descriptions of hell you may want to read To Hell and Back: Life After Death Startling New Evidence. Dr. Elisabeth Kubler-Ross believed that repressed negative emotions are the killers in our society. When dealing with patients she believed in being honest with children who needed to talk about their emotions or their impending death. 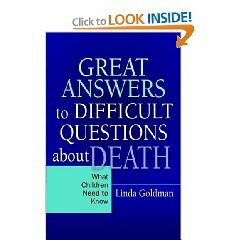 If you have ever wondered how to communicate with someone who is dying then this book provides many answers especially when you are dealing with the death of a child. 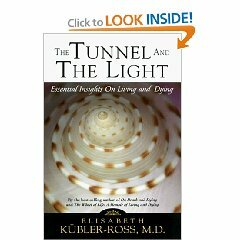 While reading "The Tunnel and The Light" I expected the book to be about near-death experiences. While there is some discussion of this phenomenon it would be incorrect to say that is what this book is about. Instead you will read about some of Elisabeth Kubler-Ross' nightmare experiences as a child and gain a deeper understanding why she was called to work with the dying. I was surprised at how much humor she used in her lectures. By reading this book you realize how human Elisabeth Kubler-Ross could be and also how wise and compassionate she was while she graced this earth. If you have ever wondered about the little illustrated book she drew for a dying child it is included at the end of this book. If you take any lesson away from this book it will probably be to be more understanding, more loving and more compassionate when dealing with the dying. This would be an excellent book for doctors and nurses and anyone who works in a hospice. It might also bring a new understanding of death to families who are living with a dying patient. While Elisabeth Kubler-Ross discounts negative near-death experiences I think it is better to read a few books that show both sides of the story so you are totally prepared for what you might experience. It is my belief that we choose the hellish or heavenly experience while alive and in this world. I've read quite a few books on near-death experiences but none of them were as graphic as this one. Unless someone had a photographic memory I doubt they could write a book like this. 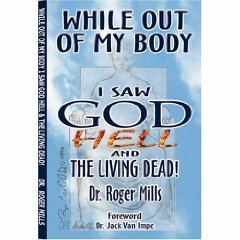 Just remembering all of God's words would be difficult when he talks to Dr. Roger Mills for extended periods of time. The entire book is backed up with scripture references and at times God apparently quotes these scriptures to Dr. Mills. What I found disturbing about the book (more than the descriptions of souls in pits of fire) was that the author believes that Christians who are living in sin or are sinning are bound for hell too. What happens if you can't confess your last sin right before you die? Does this mean you spend an eternity in hell? Fortunately he does emphasize that if you confess your sins and live a good life you can still go to heaven. Many will wonder about the idea of "once saved always saved" after reading this book. It is almost impossible to live a pure life and to never sin no matter how hard you try. Unlike other books I've read on this subject there are detailed descriptions of Satan and God. What was disappointing is that the author doesn't give descriptions of heaven even though he claims to have been there too. Apparently he is saving those descriptions for his next book. I would only recommend this book to anyone interested in finding out why people go to hell. There are descriptions of people Dr. Mills meets and explanations of the sins that caused them to be stuck in hell for all eternity. Throughout this book the author claims that Jesus says he has never sent anyone to hell that they have made the choice to reject Him themselves. From the stories about each person he meets you get the impression that God tried to speak to these people but they were willful and would not turn from their sins. The shocking thing is that the author saw many spiritual teachers in hell. There is an entire prison for pastors who have led their followers astray. Dr. Mills claims that he saw even more than he is telling but due to the graphic nature of what he saw he chose not to include those details. Personally I think the descriptions he does include are enough to scare anyone right into heaven. After reading this book you will desire to live an even more righteous life. If you are not a Christian this book might convince you of your need to accept Jesus Christ as your Savior. The title "One Minute After You Die: A Preview of Your Final Destination" seems to imply that this book will be about a near-death experience. At least that is what I thought it would be about. I didn't read the reviews before reading it. While Erwin W. Lutzer briefly explores near-death experiences he seems to doubt their validity. Instead, this book is about the realities of heaven and hell as described in biblical accounts. Whether you are sure about your final destination or have doubts, this book has some interesting answers. Erwin W. Lutzer doesn't believe in purgatory and explains why the Old Testament "hades" is not hell. He believes hades will be thrown into hell at some point in the future. He also explores the horror we feel about a God who would create a place of eternal torment. Some of these explanations were helpful to me because I struggle with this "side" of God on what seems to be a daily basis. I have always wondered how Christians can enjoy heaven while they know others are stuck in eternal horror. Erwin W. Lutzer explains that we will see it differently once we are in heaven. If you have ever wondered what happens to someone who commits suicide then this book has some answers. Erwin W. Lutzer believes that if you are already a Christian then you don't go to hell just because you have murdered yourself. However thinking you might is a good deterrent and is something I have yet to come to terms with in my own mind. So if you are interested in biblical explanations of heaven and hell you will probably find this book to be interesting. The author's honesty is refreshing as he deals with many of his reader's doubts and strong feelings about both topics. There is a description of what heaven looks like and a chapter devoted to those who still don't know if they are going to heaven or not. The only thing I noticed about the salvation prayer included in this book is that it doesn't deal directly with asking God to forgive your sins. It implies that is what you are doing but seems indirect. Most prayers I've read before seem to include a few sentences about asking for forgiveness so pray the prayer in this book at your own risk or add in - "Please forgive me of my sins." I'd advise you to consult with a pastor about what to pray to ensure that your soul is destined for heaven. "Most people die the same way that they lived." 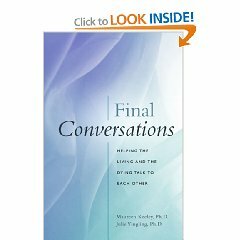 By writing "Final Conversations," Maureen Keeley and Julie Yingling have really given a gift to the world. Dying is a topic we often shy away from because frankly it scares us to think of life ending. This book however is a very healing read and addresses all the concerns you may have about dealing with the death of someone you love. The authors guide the reader through the process of dealing with death in a practical way. By reading this book filled with real-life examples you will be better prepared to face a loved ones' death and to learn from the experience. One of the stories that stood out for me was the beautiful story of a father who hums a song to his daughter over the phone just days before he dies. Since he can no longer talk this is the only way they could communicate. As she sings along with his humming they are still able to connect in a profound way. This book also explains how to communicate with someone when they are incapable of verbal communication. There are some interesting chapters in this book that explore how children deal with death and how adults deal with the death of parents who they didn't really get along with. In the end love is all that counts and these brave souls face seemingly insurmountable challenges. Normally I can finish a book in a matter of hours but this book took me a great part of the day to read and absorb. The lessons I learned will help me deal with the death of those I love. This is an especially important book that everyone should read! When I was a child we lived overseas and my maternal grandfather died. I had only seen him a few times in my life and had no emotional connection to him. So when my mother went to bed and cried for days I had no understanding of what was happening or what had happened. No one really talked to me about why my grandfather had died or even told me what death was. I wouldn't wish this type of confusion on any child, which is why I'd recommend adults read this very helpful book. Linda Goldman knows exactly what to say and how much to say. This is important because children of various ages have different questions. Children may be angry, frustrated or very sad and may not even understand what death is. I liked Linda Goldman's explanation of death as "the body stops working." That says enough while not getting into too many details. I liked her ideas of having children draw pictures of how they imagine heaven to be. She also recommended having a child write a goodbye letter. This book deals with issues like murder, cancer, hospice care, AIDS, death due to old age, the death of a pet and handling holidays after someone dies. Overall I felt this book would be excellent for anyone trying to explain death to a child in a way they could really understand what happened. There is also information on how to handle memorial services and funerals. I wish my parents had read a book like this when I was a child.